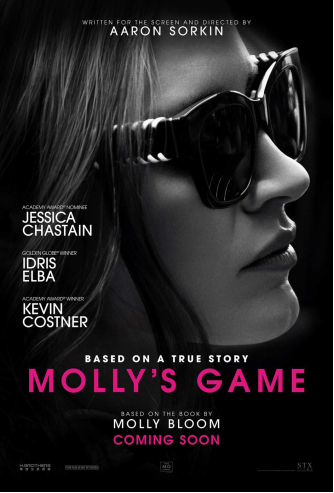 We're happy to offer our DC readers the chance to attend a free advance screening of Aaron Sorkin's directorial debut, Molly's Game, starring Jessica Chastain and Idris Elba. SYNOPSIS: MOLLY’S GAME is based on the true story of Molly Bloom (Jessica Chastain), a young, charismatic Olympic-hopeful skier who was forced to abandon athletics after a devastating injury. With law school on hold, Molly takes a summer job that introduces her to a new endeavor requiring similar discipline and drive: running the world’s most exclusive high-stakes underground poker game. The deep pockets of Hollywood royalty, sports stars and business titans give her a decade of glitzy, glamourous success, but Molly attracts the wrong kind of attention when she inadvertently engages members of the Russian mob at her table. Her streak comes to a grinding halt when she’s arrested in the middle of the night by 17 FBI agents wielding automatic weapons. Facing criminal charges, her only ally is her reluctant defense lawyer (Idris Elba), who discovers that there’s much more to Molly Bloom than the salacious tabloid stories reveal. The screening takes place Thursday, December 21st at 7:00pm at AMC Mazza Gallerie. If you'd like to attend, simply register at the STX ticketing site here. Please remember that all screenings are first come first served and having passes does not guarantee entry. You will want to arrive early to ensure receiving a seat. Enjoy the show! Molly's Game opens Christmas Day.